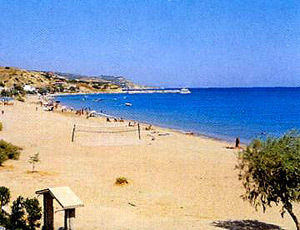 Komi is a seaside settlement, with a vast sands, one of the most beautiful and popular beaches of Chios Island. Most of the summer time season the sea is perfectly calm and the visitor can enjoy sea sports and swim. The latest years Komi has produced a rapidly development and become one of the most popular tourist area on the Island. . In the central pedestrian of Komi there are many restaurants and taverns where anybody can enjoy delicious and tasty delicacies, fresh fish and many other savory kinds of the Greek cuisine. More over there are many rooms to let and apartments suitable to offer the visitor a comfortable summer resort.